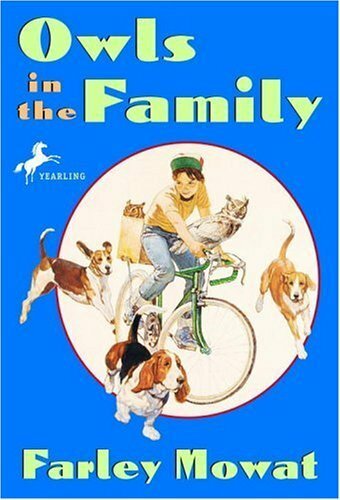 So, my parent-child book club loved this book, pretty unanimously. The adults had different views on it than the kids did, and I have to say that as someone who had read it both as a kid and as an adult, I had an interesting perspective on it. I loved this book as a kid. I remembered it as being hilarious, and sometimes a little touching, and just flat out amazing. It started a lifelong love of owls (which, coming from a family of seriously dedicated birdwatchers, I'll admit I was primed for). I remembered it being a lot longer, and there were a lot of things I'd forgotten. Like how Billy (a thinly disguised stand in for Mowat) found the second owl, Weeps. Or the part with the crows. Or the ending, which caused some of the most interesting discussion tonight -- most of us agreed it was way too abrupt, and not nearly as elegant as the rest of the book. As an adult, the humour doesn't seem as funny, and the discovery of Weeps as well as the crow chapter really stuck out more. And the ultra casual attitude towards wildlife life and death, either at the hands of nature or the hands of humans. And the keeping of ground squirrels and rats in conditions unlikely to make a humane society officer very happy today. In fact, the entire idea of going out into the wild to catch animals to keep as pets makes my inner former environmental educator froth at the mouth. Such a bad idea. But I digress into no-fun-adult-territory. It is still funny, and as an adult, it's definitely worth reading, if only for an appreciation of how much things have changed, and in some ways, how much poorer we are for that. How many kids get to disappear onto the prairie for a day with a pal, wandering around and looking for wildlife? How many kids get to hang out in an old cave dug by a long-gone itinerant next to a river, and maybe stay the night by themselves? Next to none, certainly around here, though we never really had much in Ontario to speak of anyways -- nothing like they have out West. There is a sense of wonder about this book, a casual wisdom about the wild Billy has that seems very unusual, and very precious, to me now. The prairie really lives in this book, and the abundance of wildlife is remarkable. The casual attitude taken towards it comes from its abundance; wildlife is everywhere, largely a nuisance or alternatively, an entertainment. While it's clear that Billy and his friends love animals, it's a childlike, utilitarian love -- the sort of love, though, that matures into something deep and meaningful and much more respectful, if encouraged carefully by the adults in a child's life. This book made me reflect on how the way we treat other living things, and each other, really changes as we grow up. The way we relate to the world around us changes, too. And I think that's part of what makes this book so valuable, is that it is told in such a pitch-perfect way for both its times and its protagonist's age. There are no excuses made for what I can see as an adult might have been a... well, a way of relating to the natural world that I might have winced at, if not actively disapproved. The more I think about it, the more I realize that this is one of the reasons this book is so loved by children, and such a valuable story to have in the children's classics canon. Highly recommended for reading and discussing with the children in your life. ps. from the former outdoor ed teacher: Owls? Make terrible, terrible pets. Please, for the love of all that is holy, don't ever get a child an owl for a pet. I have vague memories of reading this one as a child and loving it! Yes, things certainly have changed, haven't they? We have been listening (as a family) to My Family and Other Animals, and there is an adorable owl in there, too, which had me trying to explain about the fact that they really don't make good pets - I don't think my kids believe me, though, and who could blame them? The book makes me want an owl for a pet! I *know*! It's no fair! I wish they did make good pets. I would totally have a screech owl or two. If you want to keep going on the owl tangent, try finding Katherine McKeever's A Place for Owls, if you can. She's a Canadian owl rehabilitator, and her stories are amazing. Funny, too. One of my favourite books as a kid! "Owl? Which owl? Please ignore the scratching under the desk, that's just the... uh... library cat?" I like your reading previews! The Japanese gardening one looks fascinating. I'll be interested to hear what you think of it! I have the first Elizabeth Peters audiobook lined up to listen to soon. I'm almost done the Japanese gardening one, and I'll post a review sometime next week, I hope. It's got ups and downs. I don't think I have enough restraint in the garden to be an effective Japanese gardener! I garden more in the "cram it in there and see if I can stand the look of it in a year" style.